This is an ideal way to spread the cost of paying for lessons. Ask your family and friends to buy you gift vouchers for birthdays, Christmas, passing an exam or other special occasions. Gift vouchers make a fantastic surprise as a 17th Birthday present for aspiring drivers who cannot wait to get behind the wheel. 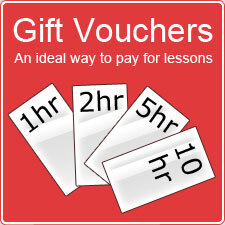 Book their first lesson on their birthday and use the vouchers for payment. Available in denominations of 1, 5 and 10 hours and prices are at current hourly rates. Payment by cash or cheque. Vouchers will be posted to you by return on receipt of payment. All vouchers are valid until used in full. Please notify Amanda of when you intend to use vouchers if not used within 6 months of purchase.